Urban Renewal in Qingdao: Creating scenic neighbourhoods, but for whom? Home /Asia/East Asia/China/Urban Renewal in Qingdao: Creating scenic neighbourhoods, but for whom? Much has been written and said about city governments across China trying to copy the urban renewal model used for Shanghai’s Xintiandi, one of the earliest examples of so-called “preservation-oriented development” (baohuxing fazhan) in China. We may think of this as the “Xintiandi-isation” of old urban neighbourhoods, because respective top-down projects have mostly resulted in the homogenization of initially unique and historical urban spaces and the creation of generic and nondescript inner city areas that are largely indistinguishable from each other. The city of Qingdao where I conducted fieldwork between 2012 and 2014 is no exception. 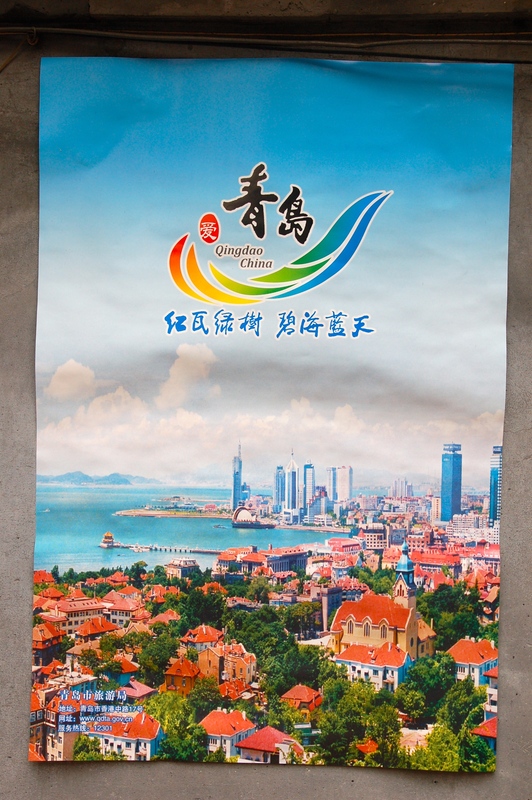 Located on the southern side of the Shandong peninsular, it is famous for its eponymous beer brand, its beautiful beaches and its European-style architecture – remains of the early 20th century when Qingdao was under German colonial rule. The government has undertaken several attempts to capitalize on Qingdao’s “exotic” image and redevelop the historic centre, resulting in the preservation of a few German monuments, with other parts being demolished, simply turned adrift, or remodelled into fake heritage sites. 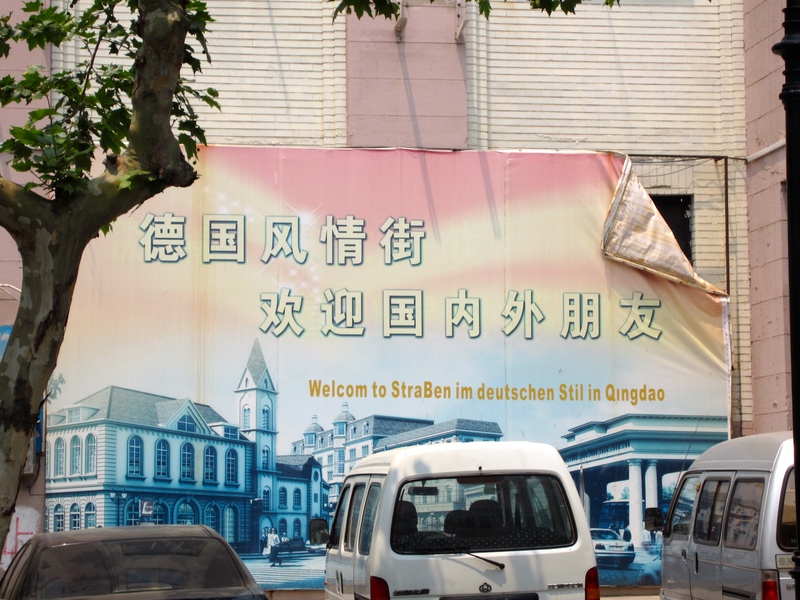 One example is Qingdao’s so-called “German-style street,” a clumsy and unimaginative attempt of a district government to turn a street that had very little connection with German colonial planning activity (it had mainly been used and developed by the Japanese in the 1920s) into a place for German “culture”. Shops and restaurants sell German products and advertise “authentic German beer”, while antique-looking street signs supposedly create an old ambience. 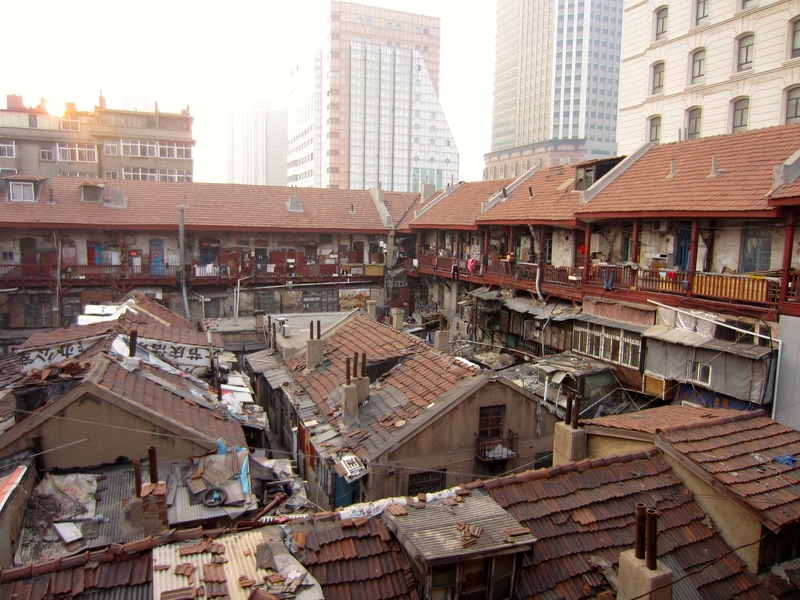 Another example is Pichaiyuan, a group of courtyard houses that served as a place for entertainment and consumption for Chinese people under colonial rule, and flourished especially during the Republican years. An official renewal project started in 2010, trying to transform Pichaiyuan into “a place like Xintiandi”, as I learnt from an architect who had been involved in the plan. In the process, residents were evicted (sometimes violently) and food stalls, small restaurants, a “folk custom theme hotel” and a stage for “cultural” performances appeared. A museum was opened and was supposed to hold an exhibition about “local Qingdao culture,” but it remained closed for the entire duration of my fieldwork. A member of staff once gave me a (perhaps unintentionally) thought-provoking explanation for this: “We need to wait and see how the government decides to develop this area in order to know what to exhibit in our museum.” It was closed down in 2014. It is obvious that this form of urban renewal has very little to do with actual historic preservation, and more often than not disrupts and displaces the local community. Cities like Qingdao implement such projects not because they are genuinely concerned about preserving heritage, but because they want to raise the “cultural” profile of their city and, following the extraordinary commercial successes of Xintiandi and others (e.g. Chengdu’s Kuanzhai Xiangzi), boost tourism, cultural consumption and ultimately generate economic profit. Interestingly, however, in second- and third-tier cities, such “preservation-oriented development” projects are increasingly failing, resulting in half-finished cultural ghost towns. Ren Xuefei presents one such example in her blog entry on Harbin. 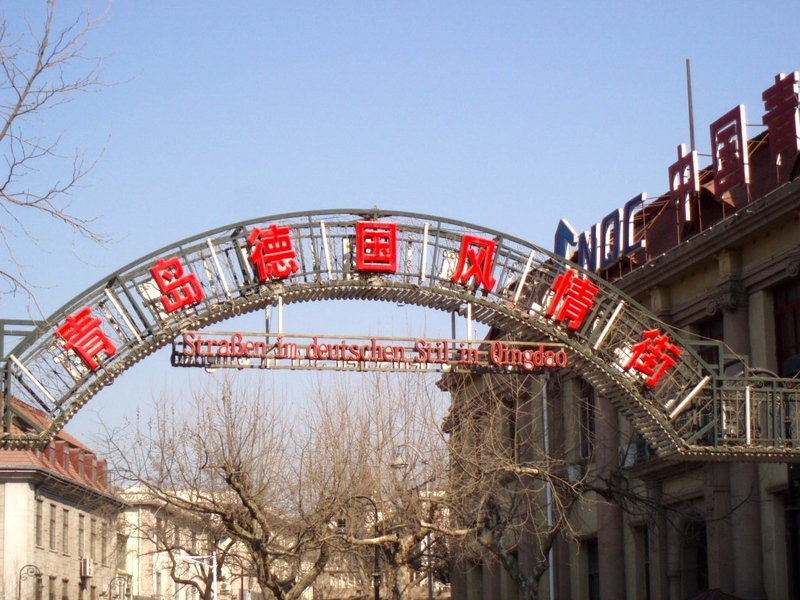 Another recent example that gained international media attention is the city of Datong (Shanxi province) whose former mayor Geng Yanbo began to rigorously revamp the historic centre before being transferred to a different city, leaving behind an assemblage of scenic streets and recreated relics that are now largely void of consumers and investors. Despite offering all the ingredients that would make for a successful implementation of cultural policy, the same has been true for Qingdao. “German-style street” remains a deserted place, even half a decade after its initial creation. Only very few tourists make it here and the government has had to offer preferential policies and subsidies to businesses to compensate for the lack of customers. Similarly, Pichaiyuan is hardly profitable. A restaurant owner told me that he only made money during summer months, festivals and national holidays. “Between November and March, this place is virtually dead,” he said. Existing shops and retail units are rented out at very little or no rent to thus breathe life into an otherwise “dead” place. A larger-scale project to redevelop Qingdao’s entire historic centre is currently under way. Its outcomes remain unclear, but there are no signs of it becoming any more successful. In the absence of potent private developers and potential consumers (wealthier middle-classes and expats), the government has drawn up several ambitious plans, but discarded them due to insufficient funds. Meanwhile, residents are being resettled, migrants forced into other city districts, local markets and shops closed down and many old buildings deserted, leaving them and the whole socio-spatial infrastructure of Qingdao’s historical centre to gradually crumble. So why are district and city governments still so eager to implement “preservation-oriented development” projects when the usual (economic) “benefits” associated with government-led urban renewal are largely absent? For one, this is indicative of the increasing importance that is attached to the idea of preservation in today’s China. The “National New-type Urbanisation Plan” (2014-2020), for instance, puts particular emphasis on “the preservation of cultural heritage”, and Xi Jinping has repeatedly called for the need to improve the quality of China’s urbanization. But the outcomes of the attempts to “preserve” are also a sign of the system-induced lethargy and the lack of innovation and creativity among local officials who merely try to follow the dictates of their superiors, here the dictate of “preservation,” expecting to thus to boost their own careers. On a more positive note, however, as data from my fieldwork in Qingdao reveals, this official preservation discourse and the increasing urgency of local officials to foster preservation has opened up discursive room for citizens to actively engage in the debates about the “what” and the “how” of urban redevelopment and to influence decision-makers. In Qingdao, groups of heritage enthusiasts have formed and put forward ideas as to how parts of the historic centre may be better preserved. It would be premature to speak of genuine participatory planning and most of the attempts to influence the government are scattered individual initiatives. Yet the ideas put forward have not gone unnoticed and, as China aspires to more sustainable and qualitative forms of urbanization, it will be interesting to conduct further research on how state-society relations are going to transform in the process. 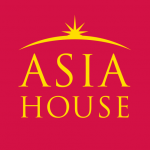 Philipp Demgenski is Adjunct Assistant Professor in Anthropology at the Chinese University of Hong Kong and Visiting Lecturer at the Institute for Historical Anthropology of Qingdao University. Image credit: Philipp Demgenski. Hello Phillip, and thank you for this timely post. It’s an enigma as to why these local government want to impose “culture” from foreign lands into their cities or towns to raise their profiles, to increase tourism, or for the locale’s self-esteem. Even perhaps for the leaders’ eventual promotion. Take the example you cited of the neglected historic area in Qingdao. How wonderful it would be for the entire section to be restored to bring it back to its original “elegance,” not only benefiting the inhabitants who would be overjoyed, but tourism could be an enhancement for the local merchants. Also, the construction of the hideous arches emblazoned with huge Chinese characters destroy any semblance of character and further depress the surroundings. Short-sighted local planners, mayors and all officials destroy the salient elements of a city in the name of filthy lucre.